We’ve featured Operation Supply Drop here at BigHeartedGamers in the past for the some of the work they’ve done supporting our military. Our military put their lives at risk for us. The least we can do as BigHeartedGamers is give something back to them, right? 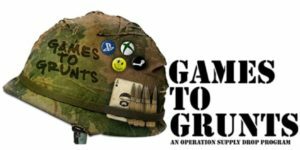 In conjunction with GovX, Operation Supply Drop’s relatively new program, Games to Grunts, allows us all to help our military enjoy themselves and take their minds off the rigors of service through gaming! Games to Grunts provides Xbox, Playstation and PC video games to active-military, veterans and their families. Our military know the “Healing Power of Gaming” during deployment as games provided distraction, unit cohesion and built camaraderie. Once home, our military use games to stay connected with friends. Despite any claims to the contrary, games are good for us. Say it with me: Games are good for us!! If you are active military a veteran or a military family, head on over to GovX right now to sign up for a free membership. Not only will your membership grant you access to free games through the Games to Grunts program, but you’ll also have access to discounts on loads and loads of stuff. If you haven’t signed up, get over there and do it now! Take advantage of all of the discounts set up for you in one place. You should also note that GovX offers discounts not only to military but to Americans of Service. Get on over and find out if you qualify for the discounts based on your service. Whether you are military or not, you absolutely have to head over to Operation Supply Drop to see what you can do to help OSD reach their goal of donating 1 million games in the year 2017. With your help and all of us working together, we can make it happen and prove that we are all BigHeartedGamers! What are you waiting for? Get on it!